The concerts selected for the Music and Markets tour will be drawn from the abundant musical offerings in the area, such as La Roque d’Anthéron Piano Festival and the Château of Lourmarin Summer Music Series. The intriguing venues include Lourmarin’s Renaissance chateau, the cloister of the 10th century Abbey of Silvacane, the wooded grounds of the Château de Florans, and even a picturesque old quarry. The schedules are finalized in May, after which we will determine the weekly schedule for Music and Markets, which will be sent to registered participants. We’ll await you in the lobby of our hotel. Check in and make yourself comfortable. Later, we’ll take a slow introductory stroll through historic Aix followed by a welcome and orientation dinner (included). We’ll get an early start to the fabulous open-air antique and vintage market of Isle-sur-la-Sorgue. Wait ’til you see the hundreds of vendors that come each Sunday, spreading out their treasures for us to ogle. We have several cherished finds from previous visits to this world-renowned market. Enjoy a typical French lunch (included) at a charming waterside brasserie in Isle-sur-la-Sorgue before our return to Aix, where you’ll have a free hour or two before an early concert, followed by a light supper. An evening concert and light supper will round out the day. The Aix market awaits, packed with marvelous treasures, from flowers, to produce, to artisanal soaps and honeys, to striking clothing. After choosing our fill of goods, we will assemble a lunch from the market bounty, and enjoy a picnic together. Dinner (included) and an evening concert will complete the day. Then a leisurely, abundant, and delicious lunch (included) at one of our favorite country inns – the Bistro du Paradou. Dinner and a free evening on your own in Aix. We’ll take a break from markets today, first exploring the fascinating villages of Rousillon and Bonnieux. 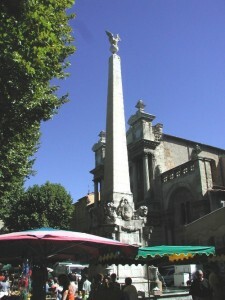 Then we’ll arrive at hilltop Ménerbes in time for lunch (included), and return to Aix before enjoying an evening concert. It’s market day in the up-scale village of Lourmarin – our last chance to find one more provençal memento to fit in a suitcase: perhaps a couple of lavender sachets – a fragrant reminder of beautiful Provence. Lourmarin offers a variety of interesting places for lunch – find a spot and enjoy! After an early concert, we’ll complete the week with a memorable dinner (included). Breakfast, then au revoirs to new-found friends before departure. * Schedule subject to program, and will be finalized in June.